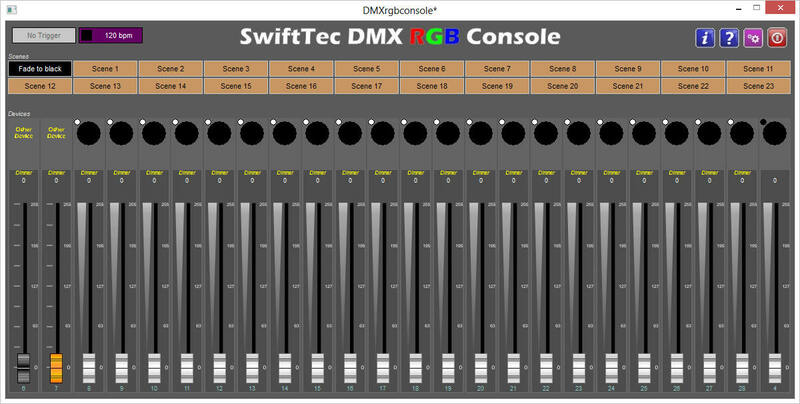 DMXrgbconsole is an enhanced version of the DMXconsole program which understands RGB LED fixtures. It builds on the easy-to-use DMXconsole design so will be easy to migrate to. Like DMXconsole it has a number of configurations / layouts which can be set in the options. There is a choice of 16, 24, 32, 48 and 64 channel versions of the console. Each channel is assumed to control a single fixture. The console allows for scenes to be recorded and recalled. The number of scenes available depends on the channel configuration selected. The faders for each channel are animated in real-time and a visual rendering of each lantern is also shown above each fader. As can be seen from the screenshot below the visual appearance is very similar to the DMXconsole module. 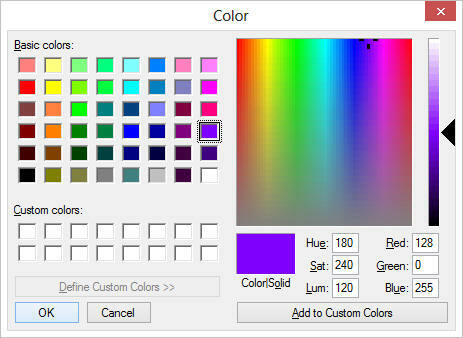 Detailed information on the operation of the DMXrgbconsole software can be found in the online help.